RARE antiques made from precious rhino horn are expected to be the star lot at an auction of sporting ephemera in the Cotswolds next week. The rhino horn ashtray and lighter are expected to achieve between £5,000 and £8,000 when they go under the hammer at Moore Allen and Innocent’s Sporting Sale on Friday, September 2. Rhino horn antiques – a precious enough commodity – have become scarcer since Europe tightened already strict rules on the selling of rhino horn last year. 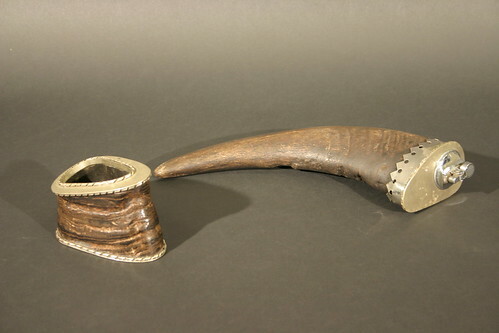 Although it is now illegal to sell mounted rhino horns and taxidermy heads in this country, antiques that have been ‘sufficiently and obviously altered’ – like the ashtray and lighter – can still be sold under strict licence. Rhino horn products have been achieving record prices at UK auctions in recent years, due in the main to the growing affluence of traditional consumer states, chiefly China. Other parts of the rhinoceros are not affected by the ban, and a set of four rhino feet is expected to achieve £1,000 to £1,500. Meanwhile a Victorian elephant tusk mounted brass gong, set on a mahogany plinth, is expected to sell for between £600 and £800 and an elephant foot decanter set, with silver-plated mounts and cut glass decanters, should fetch between £300 and £500. The taxidermy section includes the usual menagerie of native and exotic birds, mammals and fish. Among the best are three examples by the revered taxidermist Roland Ward. 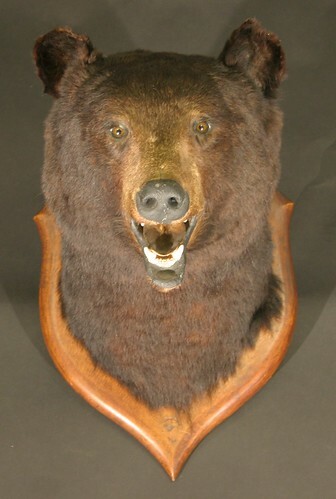 The mounted head of a black bear is expected to achieve between £500 and £700, a 7ft long crocodile skin and head should make £300 to £500 and a the head of an adult male stag, with 12 points to its antlers – should sell for between £300 and £400. 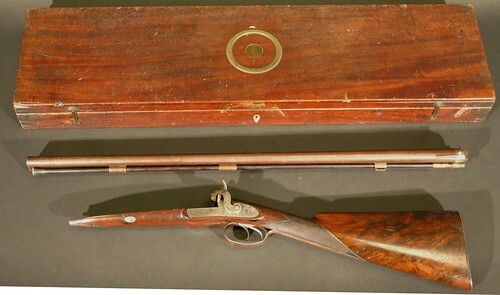 In the gun section, several collectors are known to have set their sights on an early 19th century shotgun by the renowned gunsmith James Purdy. The 20 bore muzzle-loading side-by-side double-barrelled shotgun comes in a mahogany case bearing the label of Joseph Manton, to whom Purdey was head stocker before setting up his own firm. Purdey have records of customers going back over 200 years, and from the serial number auctioneers have ascertained that the shotgun was made for a Lt Hawkins in 1806. It is expected to sell for between £1,200 and £1,500. Over in the fishing section, there are some ‘reel’ collectors items, including a circa 1910 Alcock Ariel three-inch reel in bespoke mahogany case, with an estimate of £600 to £800, a circa 1906 four-and a quarter inch Hardy Perfect brass reel (£500 to £880) and a David Slater three-and-three-quarter inch reel with bone handles, dating from the late 1800s (£100 to £150). And anyone angling for a fishing rod is in luck. Over half of the lots in the fishing section are antique split cane and contemporary carbon fibre rods with reserves at a fraction of their retail value, among them a Hardy Gem (£100 to £150), an Orvis Trident (£80 to £100) and an Orvis Superfine four-piece travelling rod (£80 to £100). The Stake and Bound, by Snaffles, which shows the hunt jumping a stake-and-bound fence. 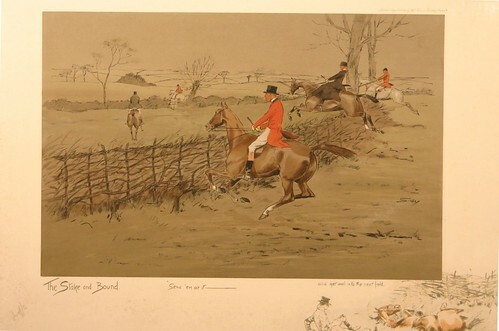 And on the walls are dozens of sporting-related paintings, drawings and prints, among them a staggering 22 prints by renowned equestrian artist Snaffles – the most the auctioneers have ever sold in one sale. Individual Snaffles prints are expected to command hammer prices of between £200 and £600.